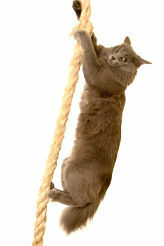 Conventional wisdom claims cat training is impossible but that thinking is wrong. Although I have a sign in my house stating..."Dogs have Masters, Cats have Slaves"...I have had some success in training a couple of the cats. The degree of training varies and length of time to achieve success also has different time intervals. With patience, treats, creative ideas, and a clicker for positive reinforcement, you will be surprised to learn that you can teach your cat to perform a number of actions and behaviors on cue. Sit up, lay down, go to your bed, fetch, turn off the lights..all of these training items are possible. 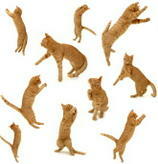 It's easier if you start when your feline friend is a kitten but you really can teach an older cat new tricks as well. Although new training methods have evolved for training dogs, the standard method tended to be harsh. If the dog didn't sit when you told him to, you forced him to sit by jerking, pushing or pulling. The dog learned to sit when told in order to avoid the unpleasant results of "not sitting". The method worked with a fair number of dogs because of their strong pack instincts. Canines are genetically programmed to accept being pushed around by more dominant members of the pack. However, with the exception of the African lion, most felines are solitary souls who come together to breed, but generally raise their young alone, and live their lives in relative isolation. Many of the behavior problems that arise in multi-cat households are a result of forcing members of a solitary species to live in close proximity to each other. 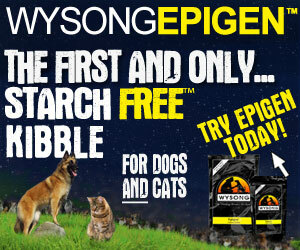 So...felines can't be trained with the methods used to train dogs. Try to force your cat to do something by jerking her neck, pushing her down to sit and then petting her when you've forced her to the floor...is likely to get you scratched on her way to hide from you under the sofa. Using positive cat training methods... a clicker, with rewards that are meaningful to her, and some patience...you will have your cat responding more quickly than you would have imagined. You can always test the waters with Feline Leash Lessons because it's less involved. 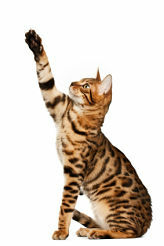 You may have already considered clicker training your cat. If not, it's a good place to start because it makes it easier if you want to create a game of feline fetching . 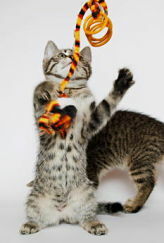 Since you want to make this a fun time for your cat there is a great selection of fun Tunnels, Feline Fun Runs, Cat Dancers, plus many other great Cat Toys Available at PetStreetMall! If you don't find what you are looking for at that location, then there is a page of reliable vendors located on the Pet Products Page.